The Shadowed Throne takes you into the heart of Nazi Germany to confront a desperate and murderous regime. Berlin is burning, and Doktor Straub’s monstrous army is hellbent on purging his city of the Allied invaders. Join Marie, Drostan, Olivia, and Jefferson on their descent into madness in a city warped with terror, blood, and war, as Nazi Zombies step out from the shadows of history. Tip: You need to get a good team of players that you can rely on to revive and support you in order to success in Zombies mode. Item Location Tip: In the previous COD games so-called 3D Printer & Weapon Upgrade Stations are now called the Mystery Box & Pack-a-Punch Stations, respectively. These locations are also indicated on the in-game map with a questionmark box/square & up arrows/triangle. In order to obtain the Pack-a-Punch Machine you need to turn on the power. It is always in the same spot. As well as the mentioned power generator locations on The Shadowed Throne map. Once you have turn o the power on theThe Shadowed Throne, then you will be able to obtain the 6 perks. They are always in the same spot. After picking up a battery from the museum or theater, you will be able to get the Wonder Weapon and tuning the radio to the right frequency to call in support on The Shadowed Throne and unlocking the flare boxes to fire them to call forth lightning-struck sizzler zombies that you need to melee to obtain the wonder bolt (Geistbolt). Then place the bolt in the machinery by the gate / apartments, which opens the gate for you to grab a battery to place in the same machinery, at which point you can pick up your wonder weapon. Your first stop on your Easter Egg Hunt and Wonder Wepon build is at the Main Street. lookout for the radio in the code is on top of it. You will need this at the church, where you can find a map and a chart on the wall. Look for a red pin in a named location for your first clue. then go to the chart to your left and use the code from the radio to find the correct frequency. Return to the radio and set the frequency to trigger a short dialogue that mentions some flares. These flares are found in a box next to a soldier in the plaza area. Melee the box twice to set off the box and shoot a signal into the sky. The airship will now come in and target zombies with geistbolts. 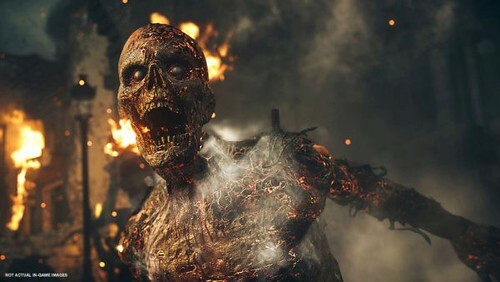 If a zombie is hit with one, he glows red and sprints a you. To grab the geistbolt from the zombie simply melee it. You need to get the battery that can spawn in several locations that chances each match. At the bottom of the apartments is the wonder weapon room that you can now open with the battery. Place it next to the gates to get inside and take it back once you are in the room. With both the battery and the geistbolt you can now build the Wunderbuss. Outside in the spawn room you will see a small power box behind some bars. Then use a grenade to open the plate and use the Wunderbuss to charge it.